Register at http://organizingclasses.com. Don’t procrastinate! Register today! January is the time to start fresh with your planner. Many of my clients work well with the planner pad. This is a different approach to the planner in that it works as “a funnel.” At the top of the 2 page week at a glance is a space for your lists, created by you with your favorite categories. This keeps all your lists and calendars together. Below this are lines to consolidate activities by the day. At the bottom are lines with the time of day to add meetings and schedule tasks. Want to learn more? Visit www.plannerpads.com. Want to learn more about other planners? Janet Barclay has written more about this! Visit her blog and this entry at Paper Planners: The Showdown. Working with my clients, I know that change happens! Here is how I know! I recently recieved the first card of the holiday season from a former client. Of course her goal was to be the first card in my mailbox! A client, on her own, decluttered her closet and took the items to Goodwill. She started and completed the job! My client says it now takes her 15 minutes to pay her bills and file her statements. A student writes in his planner each and every day, checks it regularly and makes the grades he deserves. A client realized she had all her things in too many places. Now she is consolidating them, at home and at the office. How do you know when change happens in your life? Accomplishing goals makes you not only feel successful! You also create confidence, build new habits and routines, and make a difference in your life. Entering a new year, reflect on your goals and what will be most important to you. How does change happen for you? https://professional-organizer.com/WordPress/wp-content/uploads/2016/07/logo.png 0 0 Ellen https://professional-organizer.com/WordPress/wp-content/uploads/2016/07/logo.png Ellen2009-12-28 09:17:072009-12-28 09:17:07Change Happens! This year we are embracing simplicity. Our family gift is complete! Our gift to you are these recipes. Hugs, happy organizing and happy holidays! Line 2 cookie sheets with waxed paper. Spray wax paper with PAM. In a very large bowl, melt the marshmallows and butter together in the microwave for 1 – 2 minutes until very well melted and runny. Add 1 drop at a time of green food coloring to add color you like. Stir well to incorporate the coloring and eliminate any marbled effect. Add corn flakes directly to the bowl and stir well to cover every flake with marshmallow. Work quickly at this point. Spray 2 teaspoons with PAM and use these to spoon out drops of the flakes onto the wax paper lined cookie sheets. While the mixture is still warm, place three red hots atop each cookie to represent holly berries. Place in refrigerator to harden. Transfer to covered plastic container after 1 hour. Keep stored in refrigerator until used. Line 9X13 pan with foil greased with butter. Arrange graham crackers in bottom of pan. In medium saucepan combine butter and brown sugar and bring to a boil. Remove and pour over crackers. Bake in 400 degree oven for 5 minutes. Remove and immediately sprinkle with chocolate chips. As soon as chips are soft, spread it over crackers and sprinkle with nuts. Chill 30 min or until chocolate is set. Cut into squares. We are baffled and amazed at hoarding. Where does collecting cross the line? My colleagues Arianne Benefit and D Allison Lee have so much to share on this topic! Here is the post to learn more on this topic. Your collections ARE likely to be a hoarding or collecting disorder if any of the following are true. · You aren’t able to use some of the spaces or furniture in your home for their intended purposes. For example: if your floors have become storage, and you can’t easily walk on them or you can’t use your kitchen to cook because all the “collections” are in the way. · You aren’t able to keep your collections clean and in good condition. · You aren’t able to store and/or display your collections in such a way that no harm comes to them. · The “collections” are often in your way and keep you from doing things you really want to do. · You can’t stop collecting, and feel like you “have” to – even if the collecting is putting you in debt, or keeping you from having other things in life that you want – like being able to have friends visit your home. · Your life is functioning well and you are paying your bills and taxes on time. · You could get an appraiser to verify that your collections are worth something. · You keep your collections well organized and in good condition. · Your collections give you real “joy” and don’t distress you. Ariane Benefit, M.S.Ed., is a sought-after life coach, ADHD coach, and chronic disorganization expert who has helped hundreds of clients get unstuck, embrace their imperfections, and harness their creative strengths to conquer their clutter and organizing challenges. She is the author of several highly acclaimed organizing books, as well as the popular Neat & Simple Living blog. Visit Ariane online at: www.lotusbridge.com. Click here to contact Ariane via email. My clients remind me about over acquiring or purchasing “large” quantities. It can be that the items are “on sale” and an over purchase is justified because they are saving money. Perhaps it is because they will be gifting an item and it is a gift for many different people. Or simply the purchase hits an emotional appeal due to depression, grief or other need. The first step in any process is realizing the scenario. This is difficult. How do you assess if you are an over acquirer? Think about the quantities you are purchasing. Even if you are purchasing groceries on sale, are you seeing yourself as buying too much? Do those around you ask you about the quantities you are buying? Knowing if this is a common problem for you is the first step. There are strategies to prepare yourself for the over acquiring mode. Even if you are not an over aquirer, and just purchasing in general, these questions can apply to your purchases. Be prepared to take a minute to reflect before the purchase. Here are some thoughts to think through. Do I need it? Can I borrow it from a friend or family member? Where will I place it once I purchase it? Will it be consolidated with the existing amount to fit in the designated “home’? Is it durable, well made, and affordable for the need I have? How many do I need? This is most important. Assess a number you can use regularly and keep that number uppermost as you shop. Regardless of the item, use this number as the guideline for number purchased. Be mindful of your purchases. It is easy to over do and under use! What keeps your purchasing in line? If you wonder why your child’s bedroom is messy, here’s the answer. The average child has 150 toys, according to a Time.com article, and I’m certain you’ve tripped over all of them in the middle of the night. Over Thanksgiving weekend, a friend told me how his cousin decided to take her two children to an amusement park instead of having a traditional Thanksgiving dinner. The cousin read somewhere that children between the ages of 8-10 didn’t remember what they got last year for Christmas, but they do remember trips. She and her husband decided to pare down the number of Christmas presents this year and took the kids on the outing. To test this theory, I asked my 10-year-old niece what she got for Christmas last year. Of her entire haul last year, she only remembered two things. She remembered more only after Grandma reminded her. My teen-age niece and nephew remembered most of their gifts. I suspected that if half of the items disappeared from my young niece’s room, she wouldn’t notice. I remember listening to my parents and grandparents talk about what their holidays were like growing up. Mom and her sister each would get one or two gifts from Santa, and their parents would give them nuts, hard candy and oranges in their stockings. Can you imagine a modern day kid getting excited about receiving oranges in their stockings? Instead parents are scrambling for the Zhu Zhu Hamster, which are sold out and selling on the web for upwards of $50 to $60. The actual robotic hamster itself costs around $8 or $9. I told my niece that she would have to wait until after Christmas for one, but I’m sure by then, she’ll be onto something else. As I surveyed my niece’s bedroom filled to the brim, I thought about a Christmas morning long ago. When I was a little girl, my siblings and I got the talk about how tough it was that year for Santa and how he didn’t have that much money. We knew things were tight in our own household so why wouldn’t Santa have it tough too? We were told not to expect that much for Christmas, and we used our aluminum table top tree. We kids didn’t realize at the time that our parents had forgone the real tree to save money, and we loved the sparkly, shiny aluminum tree. On Christmas morning, we each had about five presents under the tree, and I remember my sister and I each got a doll. We were excited and thought we had plenty of presents, and we didn’t find anything missing. Take out broken toys or toys no longer loved or used. As your child pulls out toys they no longer want, don’t get emotional and ask “Are you sure? Are you really, really sure?” because you have memories of it. Keep your cool. Stash a keepsake toy or two (not all of them are keepsakes) in a bin. When they’re older, they can decide for themselves what they want to keep. Clear out clothes the children have outgrown. Toss clothes that are stained, ripped, or discolored. The rest can be donated, taken to consignment shops, or save for a younger sibling. Wipe down toys with germ-fighting cleaners and donate. When donating toys to hospitals, check their requirements. For example, children at MD Anderson Cancer Center can only receive new, packaged toys that have never been used due to immunity issues. Place toys in bins and boxes. If the child is young, place a picture of what goes in the box on the front. If they can read, use a label. Pare down the number of gifts your children and family receives. You may have to talk to other relatives about how many gifts they give your child. For adults, think about “clutter-free” gifts such as gift certificates and cards, consumable products, memberships to museums, or movie tickets. The economy has thrown us all back to simpler holiday celebrations, and that can be a good thing. If you need some ideas, check out Get Rich Slowly’s website about gifts you can make all by yourself. One of the items on this list sends you to another interesting site called “Not Martha” and shows you how to make a variety of items, including cupcakes, magnets, and knit hats. Check out the link. People are so clever! If you are hauling presents with you to relative’s houses, here are some tips from Rubbermaid. Yes, one of the tips includes putting the gifts in a plastic tote. While you’re on the site, take a look at Rubbermaid’s nifty closet and garage organizers. 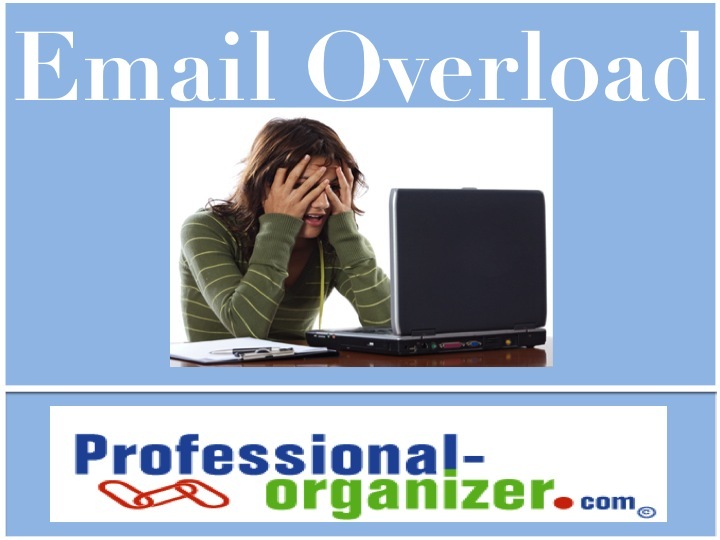 Overwhelmed by email? Experiencing email overload? Who isn’t? Basex Research recently estimated that businesses lose $650 billion annually in productivity due to unnecessary e-mail interruptions. According to Ross Mayfield of Forbes.com, the average number of corporate e-mails sent and received per person per day is expected to reach over 228 by 2010. Defining your email style with systems and routines makes all the difference. A good spam filter is a must. Anti spam technology is available at a reasonable cost so be sure you are all set. Remember to review the “spam” email just in case the filter has removed mail that you need. You can redirect this into the inbox with minor adjustment. Do not open emails, reply back or “unsubscribe” to junk email as this could place you on more spam email lists. It is best to delete all of these at the beginning of y our email session. Be sure your virus protection is up to date as well. Eliminate as many email lists as you can. This is just like stopping subscriptions to magazines you don’t have time to read! Be sure you are subscribing ONLY to necessary information, not the “just in case” information. If you are receiving jokes or chain messages from friends, kindly remind them you are not interested. If you must include email newsletters, move these into a “read” folder. Add an additional email address for just shopping and coupons. This way they are separate and not clogging your inbox. Decide the function of your email inbox. An inbox is not for filing, it is for active use. If your inbox is cluttered, it is often because of indecision. Because email floods in like a tsunami, be decisive on your email processing. Being committed to using your inbox as a temporary home for action items, it is easier to work with the clutter there. Create a subfolder named “Processed” or “Done” to eliminate delaying email filing. Often “filing” your email is put off because it is more complicated than your needs. When you need information in this subfolder, it can be sorted by arranging the subject line or sender to find it. Limit the times you check your email. Schedule two or three consistent time periods each day to go through your email inbox. Turn off your audio alarm so that incoming email is not a distraction. Plan to spend an hour at that time answering your email and truly focusing on this task. The first hour of work can be most productive by focusing on a major project and by checking your email the second hour. You will find increased productivity and a sense of accomplishment by conquering a task first thing in the day? Email is best used for short messages with direct subject lines. Need to explain a lengthy topic? Using the phone can make a difference. Organize your email with tech tools. With unroll.me, your subscriptions are organized into a list for you to read but not interfere with your work. Using Mailstrom you can group related mail and act on it as a group. If you use gmail, there’s Boomerang to help you respond to email. Check out one of these tech tools to get through your email overload. What are your secrets to email success? Set a time to cook your family favorites together. One family has a traditional pierogie recipe that they make together 2 weeks before Christmas. It takes all day and they spend it together. Set a family holiday gathering time that is NOT Christmas Eve or Day. Calendar a time, such as the 2nd Saturday of December or December 26, to gather together. This eliminates stress on the holiday itself and helps families feel they can be at home for the holiday. Instead of buying individual family gifts, host a White Elephant Swap with ornaments, holiday decor, or crazy funny gifts. Include a purchase price limit that is affordable for all family members. Not only is the game fun, this is a budget friendly way to share just a little something for the holidays. Purchase only stocking stuffer gifts for your family. Small functional items such as flash lights, gift cards or chapstick, can be great gifts and require no gift wrap. Host a decorating or gift wrapping party! Have all your family members decorate a different room, wrap presents together for other family members, or help with the outdoor lights. Set the music up high, serve some holiday cookies and you are all set! Want to spend a girls night in? Host a “girls’ favorite things” party. Just like on Oprah, everyone brings their one favorite thing, from lipstick to gloves. Attendees wrap their item in a brown bag and they swap items. What a great idea for a low stress gathering of the girls! Starting new traditions makes the holidays even more merry and bright. What family traditions are a special part of your holiday? My clients and I partner in their productivity. Each time we create a trigger to get things done, it becomes a small part of the process of success. It begins with a basic system and routine that really works for them. When someone is stuck, the first step is identifying what is getting them stuck. Being stuck is partly procrastination from fear, worry, lacking a vision, being overwhelmed or lacking a skill. Finding a partner that will help them once this is identified is crucial. The partner will bring energy, skill and accountability to the process. Add in creating an environment that will increase effectiveness. Do you work best at home or away? Do you need a minimalist environment? Music? Get to the core of what your environment includes and add routine to it. Work in high energy times consistently. Working consistently enough leads to great habits that are compelling. Now think of your self care. Are you getting enough rest? Do you eat nutritiously? Be sure to munch on an apple or banana and lean protein regularly throughout the day. The success snowball has started. The idea that as you add more and more success, it grows bigger and bigger, just like a snow ball in your yard or rolling down hill. The conclusion of a success snowball? A completed project is only a small part of it! Your outstanding feeling of confidence! This is dedicated to my incredible clients who have shared this experience with me. What is your success snowball? Please share!